It’s the first summer for the 100th Pullman Hotel, in Aerocity New Delhi, which opened last winter. 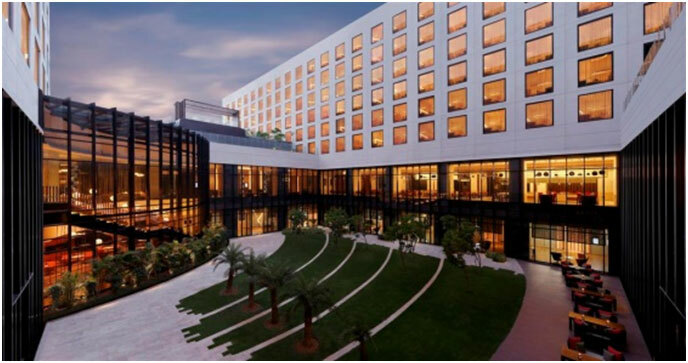 The sprawling vistas across 6 acres in the prime hospitality zone of Aerocity, which is already chalk-a-block packed with other prime hotels, Pullman gains the advantage of spaciousness as it sits attached like Siamese twins with Novotel, the Accor Hotels’ other property. The spacious undulating lobby overlooking the green courtyard, with an overhang of crystal droplets of light following the curve of the hallway, the chic and contemporary interiors are the work of the celebrated French Architect and Interior Designer Meriem Hall, who is a specialist in luxury interiors. She also claims to be the ‘space guru’, which is evident in the chic utilization of the huge open areas. All lounges, and restaurants overlook the central green, which itself is divided and utilized differently. We loved the organic herb garden, reminiscent of a kitchen garden that is more than just ornamentation. Little shrubs of greenery, rosemary, thyme, basil, and so many others, which are actually used in the kitchens across Italy, France, Spain etc. Suddenly, it feels less like a cold, detached hotel space. The subtle East element is the theme of the peacock that is played out in print, weave, shape, light fittings, color or insinuation that is visible all along. The names of its three restaurants Pluck, Pling, Honk, almost as if mimicking strings of a broken guitar, were delightfully elegant. Lunching at its European style avantgarde restaurant Pluck was a sensory high, with the very artistic presentations of dishes, all very French. With a seating capacity of 110, Pluck does not feel crowded. The freshness of the herb garden produce was a winner, as also the culinary innovations of Chef Ashish. At the same level as the lobby is the bar Pling. The wine can be ordered by the glass, from the signature Vinoteca. The layout allows for ample elbow room and easy conversations. The Asian culinary fairs are at the bistro-style restaurant Honk at the lower level. Facing the gardens, this is also the place for breakfast buffets. The 24 hour Café Pluckis located at the lower ground level, offering fresh ground coffee, and just baked croissants. 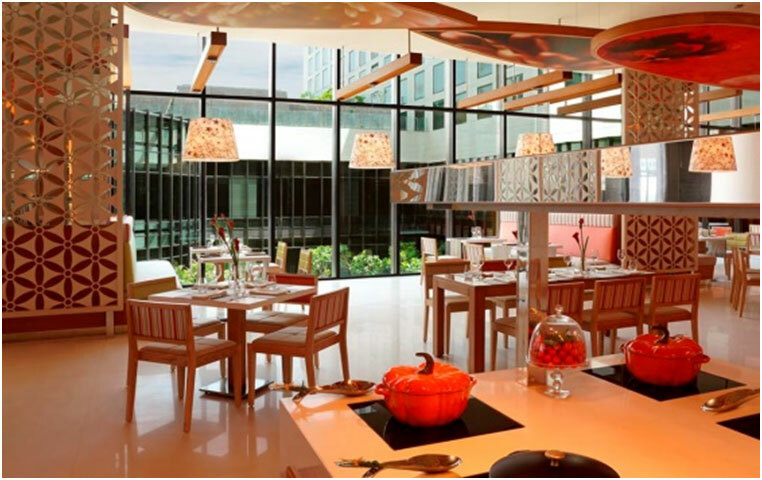 The Pullman New Delhi Aerocity, is now undisputedly the leading MICE destination in Delhi and NCR, with its vast expanse of indoor and outdoor spaces. The convention areas with 13 fully-equipped meeting rooms, three boardrooms, 1,181sqm ballroom that can easily fit in 1500 guests,large open courtyards, corridors, zones for pre-meeting events, banquet halls, seamlessly integrated across Novotelas well, easy access to all facilities across both hotels. And for the very same reasons, it is perfect for weddings. Pullman itself offers 270 rooms, 18 suites, elegantly fitted out as is expected of a luxury property. The executive suites overlook the runway, with a grandstand view of the planes taking off. Bullet Proof glass is mandatory on these rooms. Yes as also is sound proofing. The Novotel offers 400 rooms at a tad lower rates, and together they can accommodate several of the wedding party or the conference members. The full-service WOO spa is top notch. And so is the salon, which is an important facility for the wedding parties. All rooms have free WiFi, and wired high-speed internet. Some of the public areas too have this facility. Babysitting facilities too is available. The Pullman also has a special room for the differently abled, and that is a big plus. 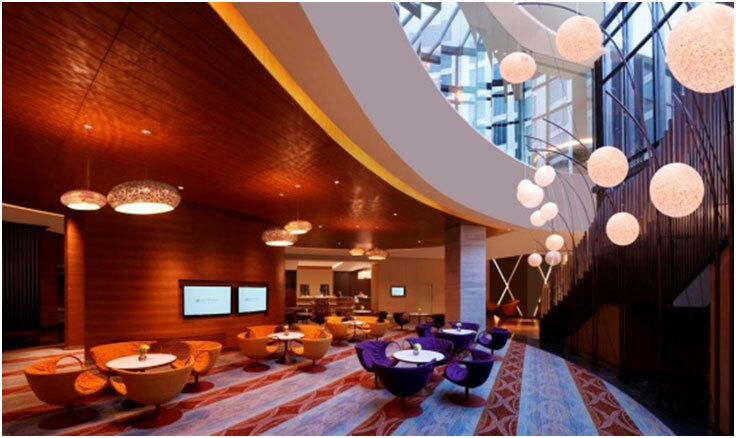 Accor Group has got it right this time with the Pullman in Aerocity, as compared to the one on MG Road, Gurgaon.